The Clean in 14 Detox is a plant-based, whole foods cleanse that flushes toxins from the body and frees the mind of negative patterns. This program was created by certified nutritionist and personal wellness coach, Missy Costello. Costello says the key to restoring vitality is to eliminate unhealthy foods and sabotaging addictive habits. Cleansing the body, mind and emotions will reset your entire system and re-establish a sense of balance in your life. This all begins with cleansing the body by eating the right foods. Cleansing allows your body to release accumulated toxins that are the cause of metabolic issues, inflammation, digestive problems and weight gain. However, Clean in 14 Detox claims that cleanses based on starvation and deprivation don’t provide adequate nutrition. They also can slow down your metabolism and create imbalances in adrenal gland and hormone function. Additionally most people tend to go straight back to their old habit once they finish a detox. For these reasons Costello wanted to create a cleanse based on food rather than juices, nutritional supplements or meal-replacement shakes. The foods offered in this program were selected because of their detoxification benefits and capacity to alkalize the body. Avoiding these items gives your body the opportunity to recalibrate itself and reconnect to your natural source of energy. It also kick starts your metabolism and promotes more balanced blood sugar so you will have less cravings. When your body is back in balance it releases these toxins naturally and it will become much easier to lose weight. Included in Clean in 14 Detox is a two-week meal plan including cleansing recipes. You don’t have to follow the meal plan exactly, but you will receive the most benefits if you do. If you want to be a little more relaxed that is okay too. Just be sure to stick within the boundaries of the recommended foods. Quinoa, brown rice, millet, amaranth, black beans, lentils, tempeh, almonds, walnuts, pumpkin seeds, flaxseeds, chia seeds, coconut milk, kale, watercress, arugula, cauliflower, spaghetti squash, yams, asparagus, tomato, avocado, raspberry, pears, grapefruit, maple syrup, raw honey, herbal tea. It’s important that you move your body every day for at least 15-20 minutes. This will help your body release toxins and cleanse itself. Find the things you love to do that keep you active, even if it is just a leisurely walk. Other recommended activities include yoga, cycling, dancing, interval training and rebounding. Weight training is also fine however you should do it at about 50 percent of what you normally would. This is because it is best to take it easy when your body is working hard to release toxins. 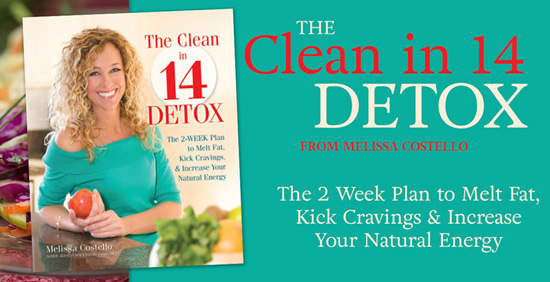 The Clean in 14 Detox: The 2-Week Plan to Melt Fat, Kick Cravings, and Increase Your Natural Energy retails at $18.95. Allows consumption of a wide variety of fresh and unprocessed foods. Offers a gentler alternative for cleansing compared to juice fasting. Emphasizes improving general health rather than simply losing weight. Plant-based diets have been associated with a wide range of health benefits. Dieters are provided with guidelines for a one-week transition after the cleanse to ensure healthy habits are maintained. May be necessary to give up many of your favorite foods during the cleanse. Most dieters experience some discomfort in the first few days as the body adjusts to the change in diet. Not possible to eat out socially or in restaurants for the duration of the program. Will require a significant daily time investment to prepare all of the meals as laid out in the 14-day meal plan. Clean in 14 is a two-week detox program to help you let go of negative habits and unhealthy food patterns. This is a gentle approach to cleansing based on unprocessed plant-based foods, which reduces the likelihood of experiencing hunger or deprivation. Costello, M. (2014). The Clean in 14 Detox: The 2-Week Plan To Melt Fat, Kick Cravings, and Increase Your Natural Energy.